The Chengdu Research Base of Giant Panda Breeding is located 10km north of the city of Chengdu in China’s Sichuan province. It is a sanctuary for giant pandas whose natural remote mountain habitats have been destroyed or fragmented by human development. With only about 2000 giant pandas remaining in the world , the Research Base plays a vital role in saving the species from extinction through its breeding and rearing programmes. 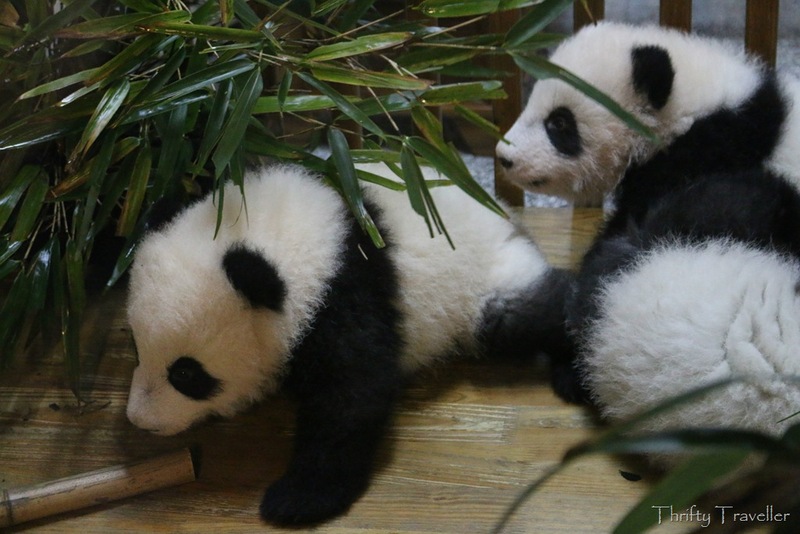 The world’s top zoos are lucky if they have a pair of giant pandas to show off to visitors. This place has dozens of them. 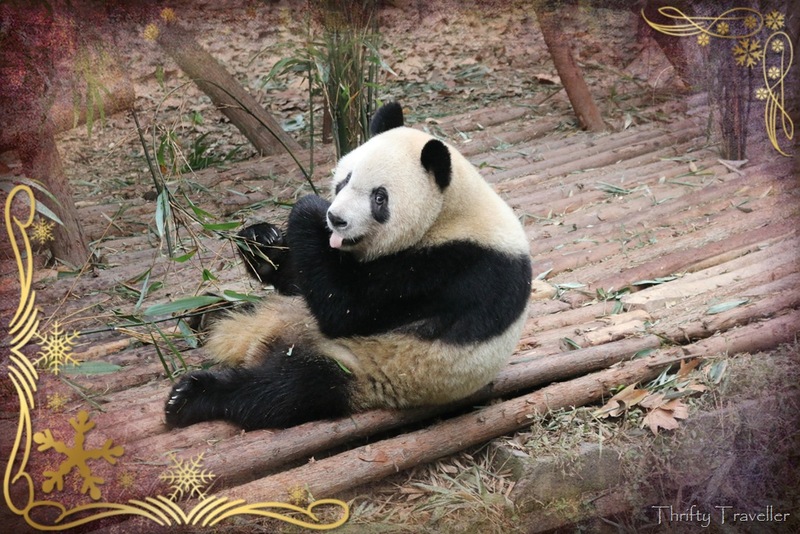 The adult pandas, who are solitary animals, have their own individual enclosures surrounded by dry moats and landscaped with trees and rocks and with feeding platforms where visitors can get a good view of them while they are eating (which is most of the time!). The cuddly cubs and ‘sub-adults’ are kept in groups and delight visitors with their playful antics and general cuteness. The above young cubs are about 3-4 months old and play, eat and sleep together in a large wooden crib at the Sunshine Nursery House. 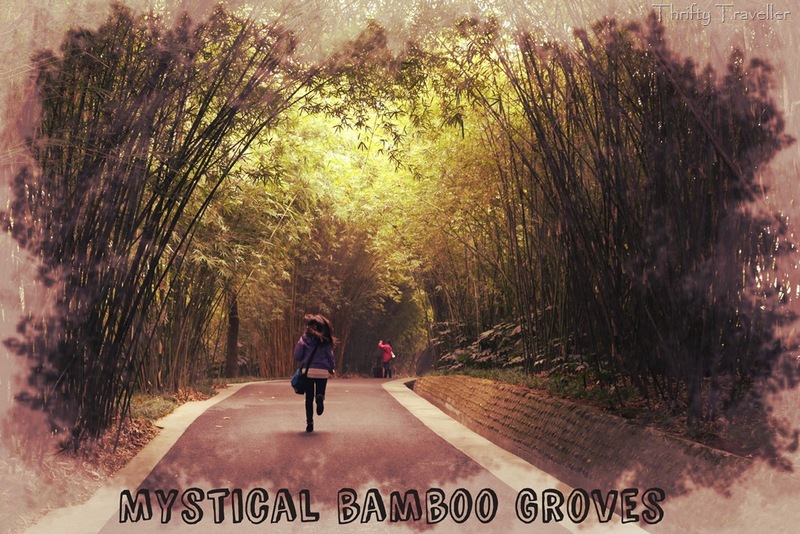 The Research Base covers an area of about 100 hectares and is planted with bamboo forest and 400 types of trees including gingko, magnolia and willow. 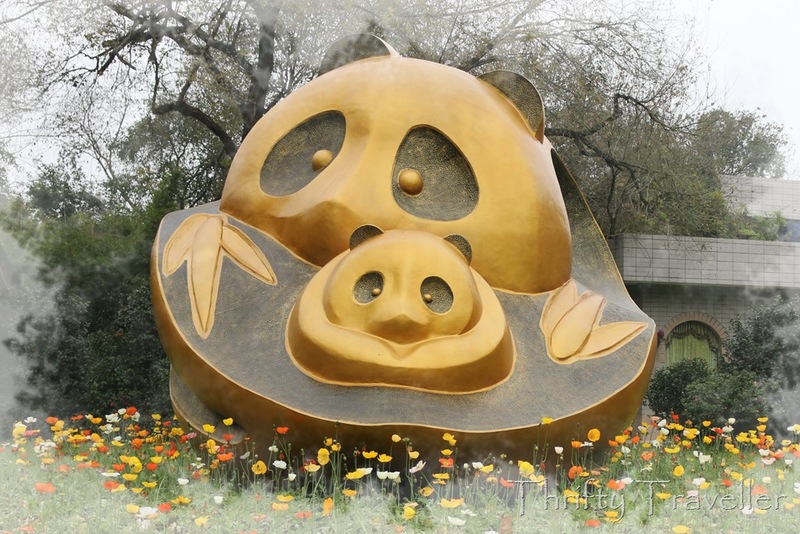 The Base includes a Giant Panda Museum, a veterinary hospital, research centre, kitchen and a number of panda enclosures and panda nursery facilities. In the wild, pandas eat different varieties of bamboo according to the seasons in order to gain the nutrients they require. Even for the captive pandas, bamboo makes up 99% of their diet. This is supplemented by bamboo shoots (a favourite treat), apples and steamed panda bread. 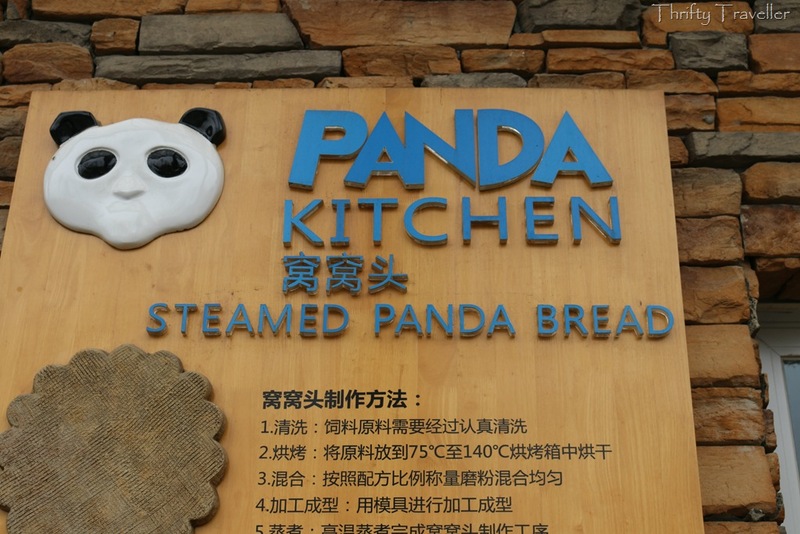 Steamed panda bread is made of corn, soybean, rice, oats, wheat, vegetable oil and added minerals and vitamins and is cooked at the panda kitchen. Each panda eats about 600-1000g of this bread per day. 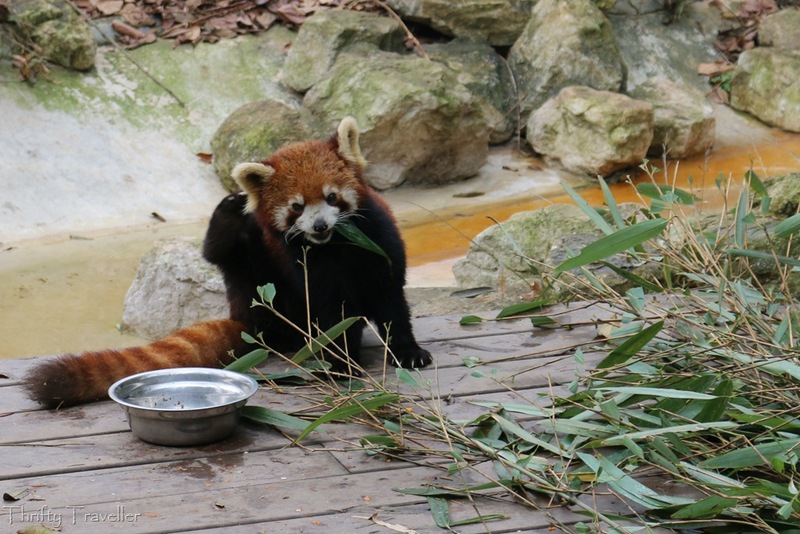 In addition to Giant Pandas, the Base is home to over 70 Red Pandas. These creatures are not related to Giant Pandas and more closely resemble racoons but they are also native to the Sichuan area and share the Giant’s love of bamboo. They too are a threatened species with fewer than 10,000 remaining. 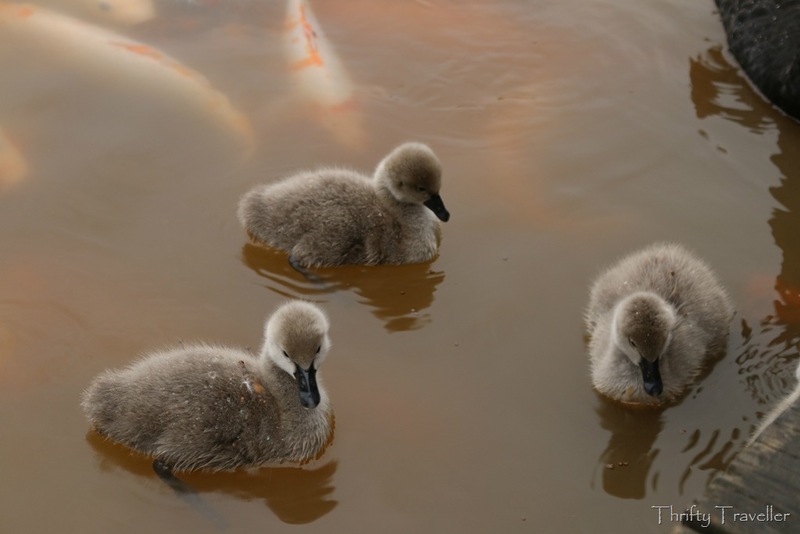 Another attraction at the Research Base is Swan Lake where you can feed colourful carp, ducks, black swans and their baby cygnets. For panda fanatics like my daughter however, the top attraction in the park must be the opportunity to cuddle a giant panda cub. These panda encounters can only be offered when the pandas are in the mood and perhaps for that reason they are not promoted actively by the Base. You need to enquire at the Sunshine Nursery House. 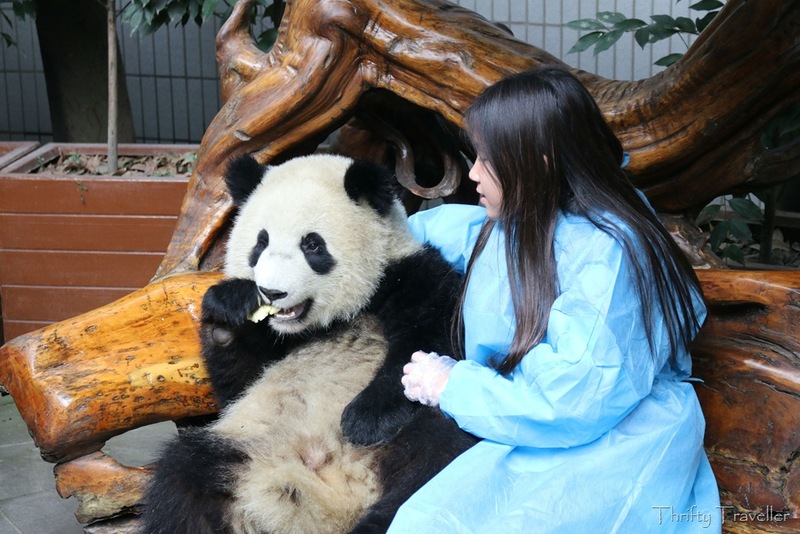 In return for a donation of RMB 2,000, visitors like this lucky girl get a rare chance to touch a panda. They receive a photo, T-shirt, video and donation certificate as souvenirs. If this sounds too touristy, panda lovers can alternatively do volunteer work at the Panda Base which mostly involves hosing down the pandas’ bamboo food, and cleaning up the enclosures. I was impressed by the Chengdu Research Base which is clean and well managed with plenty of security to ensure that visitors do not feed, tease of otherwise mistreat the animals. 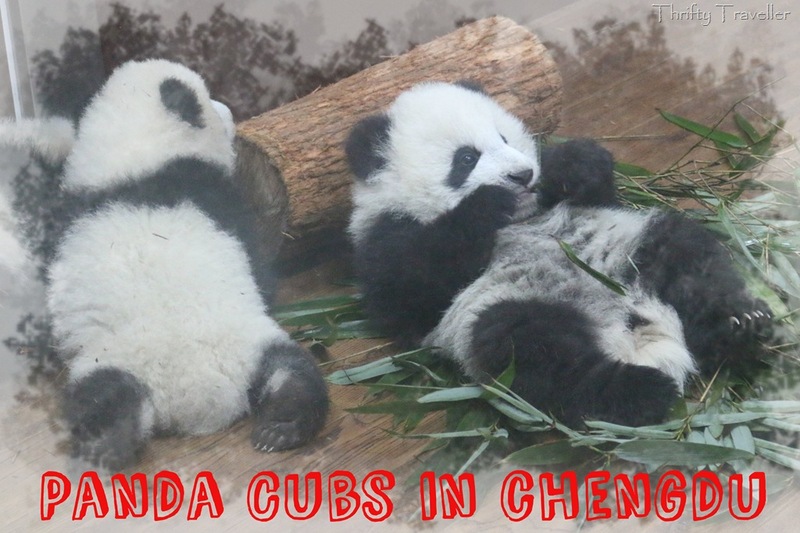 If you like pandas but don’t think you can get to Chengdu you can watch them online through the Research Base’s excellent free 24 hour Panda Cam service.